Commercial trucks exit the highway for the Bridge to Canada, in Detroit, Michigan U.S. Aug. 30, 2018. U.S. President Donald Trump is threatening to cause the "ruination" of Canada if the countries cannot reach a NAFTA deal, with sources pointing to dispute resolution and tariffs on cars as obstacles to a deal. Mr. Trump’s trade chief, Robert Lighthizer, has refused Ottawa’s key demand, the preservation of the Chapter 19 dispute-resolution system, to extract maximum concessions from Canada on its protected dairy market and pharmaceutical patents, said one U.S. industry source with knowledge of the closed-door talks. Canada and the U.S. have been negotiating since early last week, when Washington unveiled a proposed North American free-trade deal with Mexico and pressed Canada to sign on. By Friday, the negotiations between Foreign Affairs Minister Chrystia Freeland and Mr. Lighthizer at his office in Washington were also gridlocked over what guarantees – if any – the Trump administration will give Canada that it will not impose auto tariffs if Ottawa signs on to a new NAFTA, said two sources briefed on the negotiations. The President raised the pressure at a rally in North Dakota, warning that he would destroy Canada’s economy with a 25-per-cent tariff on imported vehicles if there is no NAFTA deal. The U.S. agreement with Mexico contained a side-deal guaranteeing there would be no tariffs on autos in exchange for a quota on Mexican vehicle exports to the U.S., said one source with knowledge of the tentative deal. The quota is far higher than current exports, the source said, meaning it will not kick in for years. This gives Mexico the hope of negotiating it away with a future president. The source said a promise not to impose auto tariffs on Canada is a leverage point in talks, which Mr. Lighthizer can use to get concessions on dairy or other U.S. demands. Auto tariffs on Canada would be catastrophic for both economies. A Center for Automotive Research study estimates they would kill 700,000 jobs at U.S. car companies and dealerships and jack up the price of a new vehicle. A TD estimate puts Canadian job losses at 160,000. 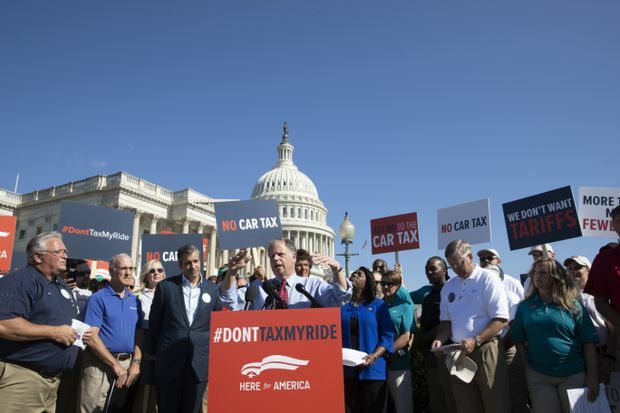 Sen. Doug Jones, D-Ala., joins Americans who work for international auto companies to demonstrate against trade tariffs they say will negatively impact U.S. auto manufacturing, on Capitol Hill in Washington, July 19, 2018. "When the President threatens to ruin Canada, to be clear, he’s threatening to ruin the American auto business,” said Flavio Volpe, head of the industry group for Canadian auto parts makers. Mr. Trump’s economic chief, Larry Kudlow, said the U.S. still had to see more dairy concessions from Canada before it would agree to a deal. The Trump administration is trying to get a piece of Canada’s protected dairy market, which keeps out foreign competition with 300-per-cent tariffs. The U.S. is also demanding that Canadian dairy farmers stop exporting their product, which they accuse of driving down global prices, said one source. Canadian negotiators are under pressure from the country’s dairy lobby not to concede anything amid a tight election campaign in Quebec, home to half the country’s dairy farms. David Wiens, vice-president of the Dairy Farmers of Canada, said any demand for greater access to Canada’s market by the U.S. is "outrageous” and would "ruin” his industry. About 5 per cent of Canada’s market for butter, cheese and other dairy products has been opened recently to imports through trade agreements with Europe and Asia. Another 5 per cent is allowed in tariff-free through trade with the U.S. and other countries.